Named for the Ojibwe word for “spirit,” the Manitou River is the heart and soul of Crosby-Manitou State Park. The park takes half its name from the river and the other half in honor of George H. Crosby, namesake of Crosby, Minnesota, who in 1955 donated the 3,320 acres of land on which this park sits. Crosby owned and managed iron mines and helped develop the Mesabi and Cuyuna iron ranges. Officials decided the park should remain largely undeveloped, and so it only contains campsites for hikers—in fact, it was the first “backpack” park established in Minnesota and contains twenty-three miles of hiking trails. 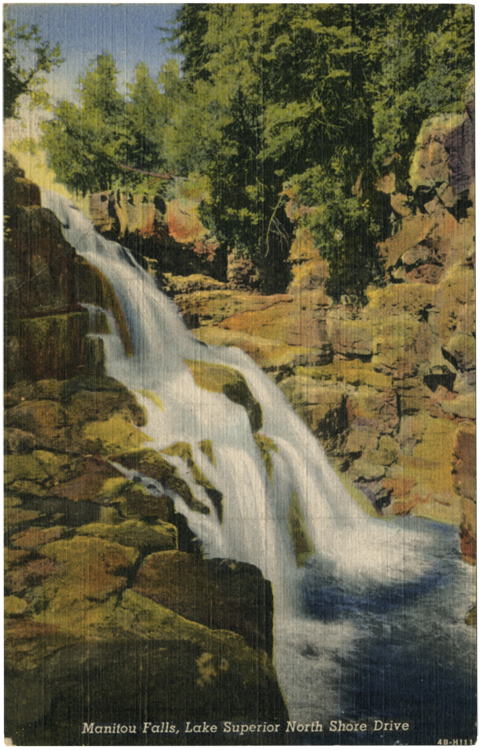 The falls pictured in the postcards drop more than sixty feet.